Earlier in the week I highlighted a narrative about student growth in Wake County Schools. These type of articles also serve another purpose, which is to attack school choice. Meanwhile, they are ignoring the multiple underlying causes of why parents are running for the exits of the public school system. 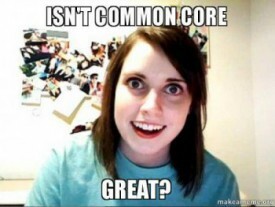 School safety is a big and increasing concern of parents as is the way the Wake Board and the NC Department of Public Instruction have ignored the parents complaints about Common Core. Instead, Wake county parents are told by idealogues like former Wake Board Chair Christine Kushner, that what is wrong with Wake schools is their fault. Gee, I hate being right so often. And why would that be? Think about it. Let’s continue on. “Home schools is probably the biggest surprise in that it has been the steadiest growth area for the last several years,” Simmons said. Really? Did he miss the DNPE’s report? Wake county had THE biggest number of homeschools with 6,359. The only other district that came close was Mecklenburg with just over 5,000. The report estimated the number of homeschool students in Wake was 10,407. Again, Mecklenburg was the closest with 7,741. For comparison, in the 2014-15 school year, Wake schools (16th largest district in the country) had 155,184 students enrolled in 171 schools. Not only was there a 9 percent increase in the number of homeschoolers statewide, the homeschool population eclipsed 100,000 students for the first time. Over the last four school years, the homeschool population increased by a staggering 34 percent. The last four years has seen the rate of homeschooling jump drastically. Now, what has happened in the past four years that might cause that? Common Core, school safety, social justice junk infused into everything, over-testing, a board that doesn’t listen, blames parents and spends money like water. I’m going to say this again, Wake County’s School Board has thus far refused to look at the reasons why parents are leaving Wake Schools in droves. Their stance thus far has been to demonize parents, blame birth rates and I’m sure aliens from Mars play a role somewhere. Parents, Do You Know What Goes On In Your Kid’s School? This entry was posted in Charter Schools, Common Core, EDUCATION, Homeschool, Wake County School Board and tagged School Choice, Wake County Board of Education, WCPSS. Bookmark the permalink.